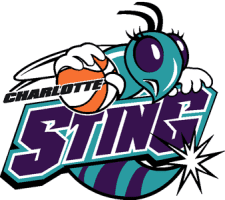 The Charlotte Sting was the WNBA's counterpart to Charlotte's NBA team at the time, the Hornets. As one of the WNBA 's founding members, the team began in 1997 and would play until 2007, when they would fold after an unsuccessful attempt to move to Kansas City. The Sting would qualify for the WNBA playoffs in their inaugural season, but lost in the first round to the eventual champions, Houston. The second year would see the same result, with the Sting making the playoffs again, but again losing in the first round to eventual champion Houston. Charlotte's third WNBA season would see the team fall to their worst record (15-17), but still acquire a playoff berth and a first-round victory before falling to the New York Liberty. Charlotte would miss the playoffs for the first time in 2000 but would return in 2001. The 2001 team would start the season abysmally, losing 10 of their first 11 games. But the team would go on an incredible tear after that, losing only 4 more games, finishing with an 18-14 record. They barely qualified for the playoffs as the number 4 seed. Riding the momentum, the Sting upset first the number 1 seeded Cleveland Rockers in the first round, then the number 2 seeded New York Liberty in the second, downing each in 3 games. The team was in the WNBA Finals for the first time in their history. The team would return to the playoffs in 2002 but would see still another first-round playoff loss, this time to the Washington Mystics. In 2002, the Charlotte Hornets would leave the city for New Orleans, but the Sting didn't accompany them. They would play one season without a male counterpart before the NBA awarded Charlotte a new franchise - the Charlotte Bobcats. Shortly after Black Entertainment Television CEO Bob Johnson was announced as the new owner of the new Bobcats franchise, he purchased the Sting as well. The team would adapt their colors from the purple and teal of the Hornets to orange and blue to match their new brother team. Owners considered changing the Sting name to reflect their partnership with the Bobcats, but shortly after announcing new colors, a new logo was introduced - the same feminine hornet logo, just with updated colors. The "Sting" moniker would remain. 2003 would see yet another first-round playoff exit for the team, this time at the hands of the Connecticut Sun. 2004, 2005 and 2006 would all be rough years for the Sting, as they would miss the playoffs all three years. After posting a league-worst 6-28 record in 2005, the team attempted to inject life into the squad by naming Charlotte basketball icon Muggsy Bogues as new head coach. Even though the team was showing signs of improvement, 2006 would be its last year in the WNBA. Due to declining attendance and revenue, owner Bob Johnson relinquished control of the team to the league. A move to Kansas City was attempted, but fundraising efforts failed. The team folded in 2007, and all players were dispersed to other teams.